It’s Wednesday all week and I’m on a Fan Mail Mission from God. As I mow them down, had to share this one just for the shape and wonder of it all . . . Thanks for your most awesome letter. I loved it. 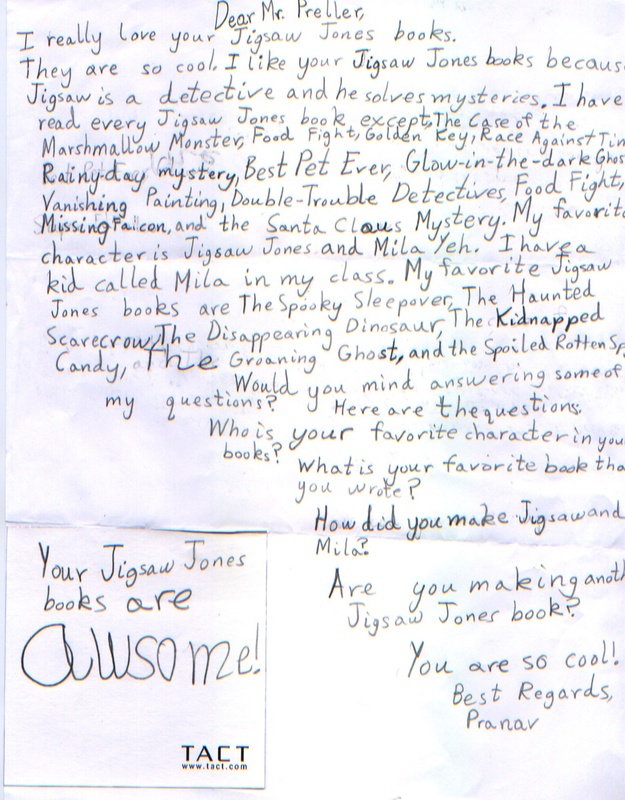 Well, it certainly seems like you’ve read most of my Jigsaw Jones books — though, admittedly, you have missed a few good ones along the way. Good luck tracking them down. * Like you, I’m a fan of Jigsaw and Mila, especially when they are together. They just have a good friendship, with differences and similarities. In a way, they are like two pieces in a jigsaw puzzle that fit together nicely. I have to add that I think Mila is a really, really good friend. As a writer, however, I enjoy Bobby Solofsky because he means t-r-o-u-b-l-e and Joey Pignattano because he’s the funniest. * I can’t pick a favorite Jigsaw Jones book, because they all sort of blend together for me, as if I’ve written one really large book. Instead I tend to latch on to little moments, isolated scenes, snatches of dialogue that occur throughout the series. My oldest brother, Neal, died long ago and I quietly paid tribute to him in Chapter 7 of Jigsaw Jones #10: The Case of the Ghostwriter. Other than Jigsaw, I’m very fond of my books: Along Came Spider, Six Innings, Justin Fisher Declares War, and Bystander. * Right now, I have no plans to write another Jigsaw Jones book. I’d love to do it, truly, but I think my publisher already has enough in the warehouse. Thanks for calling me “cool.” In truth, it’s all I ever wanted.